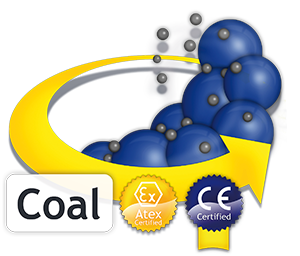 Are you looking to reduce your lev­els of un­burnt carbon? SmartFill puts key in­for­ma­tion at your fin­ger­tips. That’s your key to suc­cess! A homogenous degree of fin­eness is vi­tal to en­sure op­ti­mum com­bus­tion pro­per­ties for your coal. SmartFill—a fail-safe, high-pre­ci­sion fill-lev­el and tem­per­a­ture meas­ure­ment sys­tem for ball mills—has been de­vel­oped to help you a­chieve this. For the first time ever, you can now ac­cu­rate­ly meas­ure the most im­por­tant grin­ding pa­ram­e­ter: fill lev­el. Since it is not pos­si­ble to meas­ure this key pa­ram­eter di­rect­ly, meas­ure­ments need to be taken on the ba­sis of a­cous­tics or vi­bra­tions. Pre­vi­ous meas­uring meth­ods, such as mi­cro­phones, have a num­ber of ob­vi­ous dis­ad­van­tages that mean they are whol­ly un­suit­a­ble for a­chiev­ing the ex­act­ing stan­dards re­quired by to­day’s in­dus­trial pro­duc­ers; even meas­ur­ing the drive cur­rent does not give ac­cur­ate e­nough re­sults. How does SmartFill improve your energy efficiency? Ac­cur­ate meas­ure­ments al­low you to con­trol the mill, mean­ing you can main­tain an op­ti­mum fill-lev­el at all times. Con­se­quent­ly, the mill’s op­er­a­tion is sta­ble and reg­u­lar, re­sul­ting in a much more u­ni­form coal out­put. What is more, set­ting the op­ti­mum fill-lev­el re­du­ces wear to the balls and mill shell. You can a­void over­fil­ling the mill, there­by im­pro­ving the plant’s up­time; this, in turn, leads to in­creased lev­els of pro­duc­tion. Ir­re­spec­tive of the type of con­trol sys­tem used, SmartFill al­lows you to make the right de­ci­sions at the right time. Thanks to SmartFill, you can now act rath­er than re­act when con­trol­ling your mill. SmartFill meas­ures the me­chan­i­cal vi­bra­tions of the mill us­ing up to three dif­fer­ent types of sensor, all of which are po­si­tion­ed di­rect­ly on the mill shell. The meas­ure­ment in­for­ma­tion is trans­mit­ted wire­less­ly to the rel­e­vant tes­ting in­stru­ment, and can be con­nec­ted to your PLC (4—20mA). What type of mills is SmartFill suitable for? SmartFill (Coal) is suit­a­ble for use in a va­ri­e­ty of dif­fe­rent types of ball mills, in­clu­ding (air-swept) tube mills, cen­tre dis­charge mills and SAG mills. It can also be used ir­res­pec­tive of the type of lin­ing (steel/rubber), grind­ing media (balls/cylpebs) or grind­ing proc­ess (wet/dry).